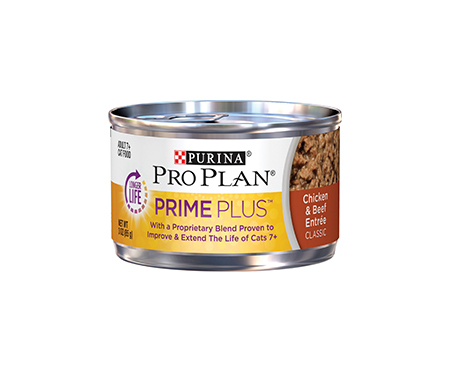 A cat’s body starts to change around the age of 7, so Purina Pro Plan Prime Plus Adult 7+ Chicken & Beef Entree Classic Canned Cat Food was specially created to meet their needs. Backed by an extensive, nine-year study, this diet has been proven to actually improve and extend their life. It uses a special blend of nutrients to support a strong immune system, and it also helps to maintain lean body mass and a healthy weight—a crucial component for their overall health. Improved microflora support a balanced digestive system, and with real chicken as the number one ingredient, it’s total nutrition that they’ll enjoy down to the bottom of the bowl. Backed by 9 years of proven research to extend and improve the quality of life for cats over 7 years. Features the antioxidants beta carotene and vitamin E, prebiotic fiber from chicory root and omega 3 and 6 fatty acids. Propriety blend also contains improved microflora for a balanced digestive system. Helps maintain lean body mass and supports a strong immune system, plus a healthy skin and coat. Made in the USA with real chicken as the first ingredient for tasty flavor, in a pate form.